To bike or not to bike? That is the question! 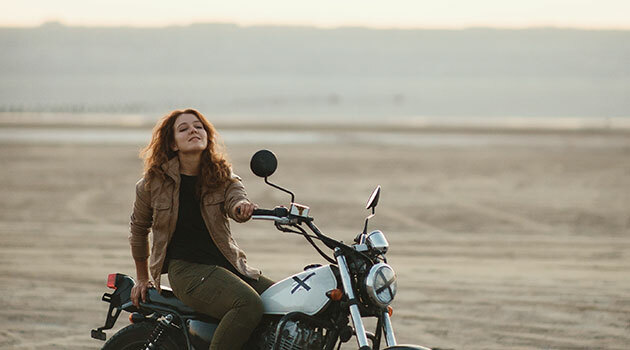 If you are considering motorcycle ownership, you probably want to weigh the pros and cons before you buy. Use this list to help you decide. The cool factor. Riding a hog might help you turn more heads and give you street cred. Saves money. Motorcycles tend to get better gas mileage than most cars, so you'll save at the pump. Also, motorcycles often cost less money to maintain and service. Motorcycle insurance sometimes costs less than car insurance, too. You might find numerous ways to save when you ride a bike. Saves space. Parking is a breeze with a bike. Your vehicle will ease into spots that cars can't fit into. Easier to clean. With less space to manage, you can clean a motorcycle more quickly than a full-sized car. Less fuel emissions. Motorcycles tend to be more fuel efficient than most standard cars. If you want to decrease your carbon footprint, motorcycling might help. Resale value. Bikes often retain their resale value more than cars because they tend to not rack up as many miles as cars do. Joy rides! Most bikers will tell you that riding a motorcycle is just plain fun. A fair-weather friend. In rain, snow, wind or extreme heat, you might miss the shelter of a car. Also, driving in difficult conditions such as icy, wet or gravely roads becomes more challenging when you travel on two-wheels instead of four. Less space. With a bike as your vehicle, you will have much less room to store your personal items and transporting friends will prove limiting. Safety concerns. Even with a helmet on, you will be more vulnerable to the elements and potential traffic accidents on a motorcycle. Ride with care! Helmet head or the windblown look. If you care about your hairdo, a bike might not be for you. Helmet laws in some states require you to put a lid on it. Even if your state doesn't require one, helmets are a good call for your safety. Licensing requirements. If you want to ride a motorcycle, you need a motorcycle permit, endorsement, or license. Motorcycle licensing tests often differ significantly from standard automobile licensing tests. Consult with your local department of motor vehicles to learn more about the testing requirements of your area. Endurance. Motorbikes tend to have less longevity than cars. While a car might easily live to see over 200,000 miles of road time, a bike typically spends approximately 100,000 miles on the road. Do you own a motorcycle? What are the pros and cons from your perspective?